The push of legal sports betting into mainstream national consciousness reached a new mile post on Sunday with a segment on the 51st season of hallmark CBS news magazine 60 Minutes. The episode, which featured interviews with Marshall University athletics director Mike Hamrick, Florida State University associate professor Dr. Ryan Rodenberg and National Basketball Association commissioner Adam Silver, broke no new ground in the debate over legalized sports betting. Hamrick sounded foreboding and Silver was a mitigating voice for the new reality of sports in North America. Producers of the segment, All Bets Are On, used the NCAA Tournament, which is the most popular betting event in the country, as a hook. And the 100th anniversary of the most notorious sports gambling scandal in the United States – the Chicago White Sox throwing the 1919 World Series – was a sober entry point into a primer on the debate for the uninitiated. Among the newsworthy bits in the segment, Rodenberg, who works in the FSU Department of Sport Management, predicted that 15 states will implement sports betting by the end of the year, with a dozen more legalizing but not yet finishing frameworks to begin accepting bets. Seven states joined Nevada in offering sports betting since May, when the Supreme Court repealed the Professional and Amateur Sports Protection Act of 1992. Hamrick spoke of an institutional fear among his peers over student-athletes becoming compromised because of economic and other factors. “They can be compromised,” Hamrick said of student-athletes. Transgressions, he noted, could involve not only altered performance but the sharing of private health information that could affect wagering markets. He deployed an anecdote from a men’s basketball game at the University of Nevada-Las Vegas to describe when he says he became aware of what he sees as the pervasiveness of sports betting. Hamrick claims that UNLV fans booed one of their own players at a home game for failing to score an uncontested layup at the end of a game. That score would have pushed the game into the over for bettors. Marshall is in Huntington, W.Va., which offers legal sports betting, including mobile. According to the Charleston Gazette-Mail in West Virginia, Hamrick was recommended to 60 Minutes by Lead1, an organization for Division I-A athletic directors, “because of the fact that I spent six years as the athletic director at University of Nevada Las Vegas, where sports gambling was legal. Reporter Joe Wertheim noted in the segment, though, that “gambling, long seen as a vice, is now embraced in popular culture,” increasingly through apps that allow in-play bets – or wagering during a contest – on mobile devices. 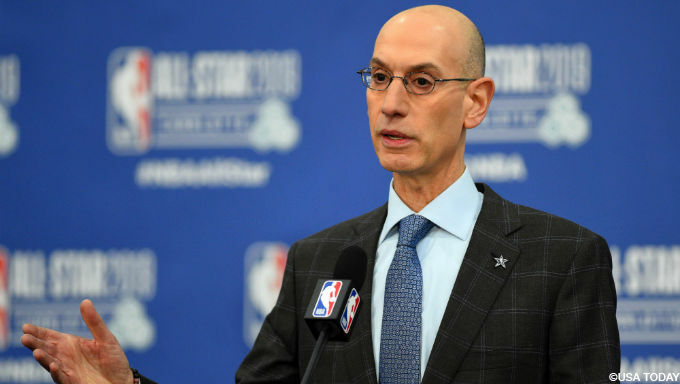 Silver, an early advocate of so-called integrity fees that sports betting entities would pay to leagues to subsidize alleged security concerns, provided the counterbalance to Hemrick’s assertions. Interestingly, in the post-PASPA wake, the NBA has been most proactive of all North American professional sports leagues in synergizing with sports betting enterprise both in terms of sponsorships and fan experience.